Gearing up for its eventual launch with Best Buy starting this Sunday, May 22nd, there are some people out there who are genuinely glad to see the HTC Flyer becoming a reality, though, they might be bummed out when they open up the box. 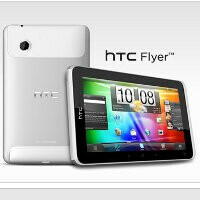 Apparently, the Wi-Fi only version of the HTC Flyer that Best Buy will be selling shortly doesn’t come bundled with the stylus that’s supposed to complement and enhance the experience. Obviously, prospective customers are going to be required to purchase it separately at $79.99, which brings the tablet’s total cost of ownership to $580. Thinking about it more, some might be baffled as to why there’s such a premium associated with the stylus, but then again, it’s not simply a single piece of plastics. Rather, it’s based off N-Trig’s DuoSense capacitive touch technology. Regardless of that, the lack of the stylus doesn’t limit the tablet’s overall operation since it should work swimmingly like most other Android tablet’s we’ve seen thus far. I wonder if the stylus will get bundled if the tablet sales are slow? ASUS is priced $50 less for a larger and better spec'd tablet.... Of course they (ASUS) aren't producing many at the moment. Ugh... no just no... bad idea. They'll probably want to make the tablet to come with the stylus. Will cost less probably if they just sold it with the tablet anyway. This makes me really irritated.